(NaturalNews) A Somali refugee university student named Abdul Artan unleashed a mass attack on fellow students today at Ohio State. The Muslim radical, who entered the United States under a student visa, pulled a fire alarm then "mowed down evacuating students and staff with his car," reports the UK Daily Mail. The lying mainstream media originally misreported this story as a "mass shooting," but it turns out the gunshots were law enforcement officers shooting Artan, halting his reign of violence as he stabbed students with a butcher knife. The name of the police officer who shot and killed Artan is Alan Horujko, who has been active with the force since January of 2015. UK Daily Mail describes the incident as a "ISIS lone wolf-style attack" carried out exactly as ISIS called for earlier this year. Ohio State is a "gun free zone," meaning the school entices terrorists to target the campus for mass killings of students, knowing that students are not allowed to defend themselves with firearms. 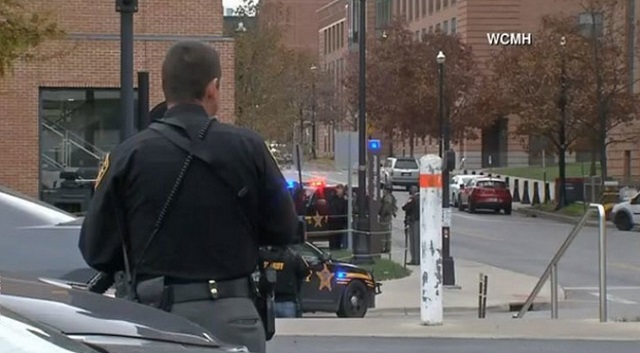 Notably, it was finally a gun carried by an OSU law enforcement officer who used lethal force against the assailant and ended his stabbing spree. As you read all this, consider the evidence that Barack Obama, a Muslim hater of America, has spent much of his presidency deliberately placing Muslim refugees in cities and schools across America. The strategy is to distribute radical Muslims across the country, then wait for a few of them to unleash "lone wolf" attacks to cause maximum chaos and terror among the American populace. "A U.S. official identified the suspect as a man of Somali descent," reports local CBS News. "The official identified Abdul Razak Ali Artan as the now-deceased suspect. He was born in Somalia and living in the United States as a legal permanent resident." "Artan fled Somalia with his family in 2007 before landing in Pakistan," reports Daily Caller. "He moved to the United States in 2014, where he was granted legal, permanent status." “The Lantern” — OSU’s campus newspaper — ran an interview with Artan just a few months ago, in which he criticized the school for not having Muslim prayer rooms on campus. Apparently, he is exactly what the media portrays radical Muslims to be! He's a terrorist who unleashed mass death upon American students. Once again, this attack demonstrates the absolute lunacy of "gun free zones" on college campuses. Had students been allowed to legally carry self-defense weapons, they could have very likely stopped this attacker before he stabbed so many people. This incident also reinforces the importance of so-called "extreme vetting" -- a Donald Trump strategy for making sure we don't allow radical Muslim terrorists to immigrate into the United States where they are later activated as lone wolf terrorists. More news on this issue is being published every few hours at NewsTarget.com.